Fulbright New Zealand and the Fulbright New Zealand Alumni Association invite you to a free panel discussion seminar on the topic of ‘Mind the (gender) gap: Women’s equality in New Zealand and the Pacific’ with Fulbright alumni Horiana Irwin-Easthope, Nicola Kean and Makerita Urale, and Public Service Association national secretary Erin Polaczuk. New Zealand led the world in giving women the vote, but more than a century later it is dropping in international indexes measuring the gender gap. 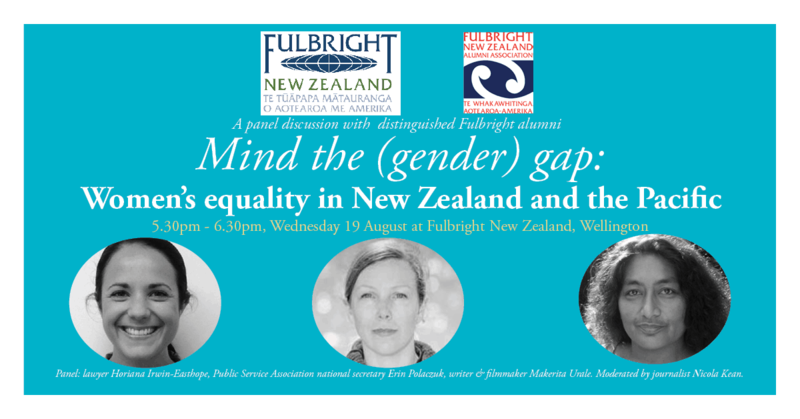 Fulbright and Leadership New Zealand bring together a range of young alumni to discuss why and where to from here for women in New Zealand and the wider Pacific region. Please arrive from 5.15pm for a 5.30pm start. Refreshments provided. Click here to register.